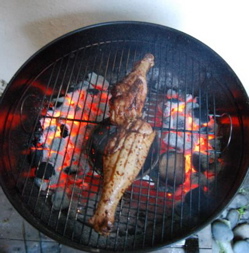 Most people know how to cook with direct heat, but indirect heat grilling is often seen as a slightly more advanced barbecuing technique. That doesn't mean it has to be difficult to do though! With a few tips, you can be barbecuing great, juicy roasts in no time on your outdoor grill. So what is indirect heat anyway? Indirect heat means that the heat source, your hot embers or gas burner, are somewhat removed from your food so that direct radiant heat onto the surface of your food is minimized. However, at the same time, you have a lid on your grill, creating a closed space to trap hot air and smoke. This produces an environment similar to inside your stove where hot air circulates by convection around your food, slowly roasting it. By minimizing the direct radiant heat on the surface of your food, indirect heat grilling prevents the surface from burning before the middle of your roast is done. For example, if you've ever tried cooking a whole chicken on your grill over direct heat, you'll have found that the surface skin and fat burns to a charred crisp long before the deep insides are cooked. Not very appetizing! What do you need to cook with indirect heat? 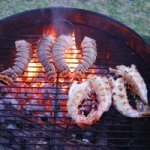 A grill or barbecue with a tight-fitting lid - charcoal or gas is fine but for a gas grill you should have at least 2 separate burners which can be controlled independently of each other, 3 or more is ideal. A very small grill may be difficult. Optional: A metal pan of water which fits in your grill under the center of the grill grate. I find the disposable metal roasting pans you can buy in the supermarket work best for this. Optional: Basting liquid and a basting brush. 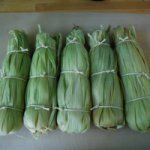 While not required, this is an important want to add flavor and succulence to your food as it roasts when indirect heat grilling. It helps glaze the surface and keeps your meat moist and flavorful. You can use a mixture similar to that which you marinated your food in, or come up with another complimentary flavor to accent your food. Basting mixtures often contain things like, olive oil, red wine vinegar, lime juice, fruit juices, wine, herbs, pepper and salt. See grilling recipes for some ideas. Optional: For charcoal grills, indirect heat grilling charcoal briquet holders, explained below. Optional: A grill thermometer helps to keep track of the temperature inside your grill while cooking. Optional: Meat thermometer, while not mandatory, it helps to determine when your roast is done. Optional: Smoking wood chips (hickory, mesquite, apple, etc.). If you have a gas grill you will need a metal smoker box to hold them. I really recommend this to add some nice, smokey flavor to your roasting poultry or meats. If using a charcoal grill, start your charcoal in the usual manner. When ready, separate your charcoal into to large piles on either side of your grill. This can be aided by indirect heat grilling charcoal briquet holders which are crescent-shaped metal baskets which neatly hold your briquets on either side of the grill. They are available at most grill stores or through Weber.com. 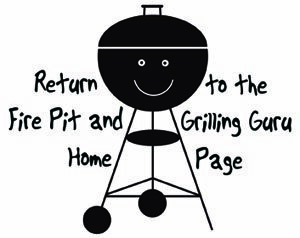 If using a gas or natural gas grill, turn on your burners, but leave a space on your grill unlit. If you only have two independent burners, light one and the space over the other burner will be your cooking area. If you have three burners, light the two outermost burners and leave the middle unlit. Place the metal roasting pan in the middle of your grill, between your heat sources, directly under your cooking area. If you are using charcoal, put it in the middle between the piles of charcoal. If you are using gas, place it on top of the unlit burner. Fill the roast pan half-way with water. Some people like to add other fluids to the pan to help flavor the meat while indirect heat grilling, such as wine, beer, or fruit juices. They will evaporate and help steam the roasting meat. This is optional though, just plain water is ok. Also, the pan helps catch drippings and prevents fats from causing flare-ups which can burn the surface of your roast. If you are using smoking woods, you can add the chips or smoker box to your heat source at this point. Place your grill cooking grate on your grill and now you are ready to start cooking! Place your prepared roast on your indirect heat grilling cooking area, above the roasting pan, NOT directly above the hot coals or burner. For most meats, I like to marinate the food ahead of time to add flavor throughout the meat. It should be seasoned with salt and pepper before adding to the grill. Very important step! Close the grill! Do not just leave it open. Open, no hot air and smoke will accumulate and surround your food, they will be lost into the environment. You wouldn't leave your oven open while roasting a chicken would you? 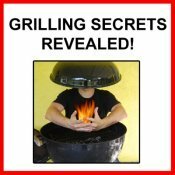 For indirect heat grilling, your grill should be closed too! Check your grill thermometer periodically to ensure there is adequate cooking heat inside your closed grill. If not, add more charcoal or turn up your burners (but not the burner directly under the food!). Check your food periodically while indirect heat grilling. Once it has been cooking for some time (15 - 20 minutes or so) and has developed a bit of color, you can start basting it with your basting mixture. Baste periodically as the surface dries out, always closing your grill between manipulations. Over time, this should help develop a nice glazed appearance to the surface of the meat. While you don't necessarily need to flip your roast during cooking, check it to ensure that it is cooking evenly. If one side is too close to the heat sources, it may be cooking faster than another part. If this appears to be the case, rotate or adjust the position of your roasting food to even it out. It may require several rotations or adjustments throughout the cooking process. When checking or basting your food, keep an eye on your pan of water. If the fluid is close to evaporating completely, add some more. Also, depending on how long your cooking time is, you may want to add more smoking wood to your heat source periodically. Continue this process until your food is done, periodically basting, checking grill temperature, adding coals or adjusting heat as necessary, adjusting the position of your roast and refilling water as needed. How do you know when it is done? I like to use a meat thermometer, especially for larger roasts which are hard to tell if the depths are done. While a smaller piece of meat can be tested just by feeling, a large roast bird is harder to tell. You can check its internal temperature with a thermometer. Alternatively, you can poke a long trussing needle or fork into the depths of the meat. The fluid should run clear when it is done, not bloody or pink. If all else fails, cut into the meat to look at it directly to see if it is done. When done, remove your roast from the grill to a pan or platter. Cover with aluminum foil and let it rest. Don't skip this step! Let your meat rest adequately to allow the heat and juices to redistribute and equilibrate inside your roast. A large roast like a whole chicken or leg of lamb can rest for 30 minutes or even close to an hour and will still be warm and ready to eat. So don't skimp on the rest period! Thats it! Not as hard as you thought, right? Once your grill is set up for indirect heat grilling, it's not that different from roasting in your oven, except that here you are adding rich, delicious, smokey grill flavors to your roast food. Done with indirect heat grilling?